Since joining the Air National Guard in November of 2013, I haven't had a moment of regret. In fact, it's one of the best decisions I could have ever made for myself, my family, and my future. There's something amazing about the transformation that takes place when you put on the uniform. There's a huge sense of overwhelming pride... of gratitude... of honor. To think about all who came before you and all who have given up so much to defend their country—it's truly something so big that I'm so honored to be a part of. I feel this way whether I'm in or out of uniform. Now that I'm a military member, I hold myself to a higher standard. I not only show integrity, courtesy, respect, and service during drill weekend, but it's expected of me 24/7. And that's a standard that I am proud to uphold. When you're a part of something so big, something so much greater than yourself, saying that "it's an honor" just doesn't do it justice. It's real. 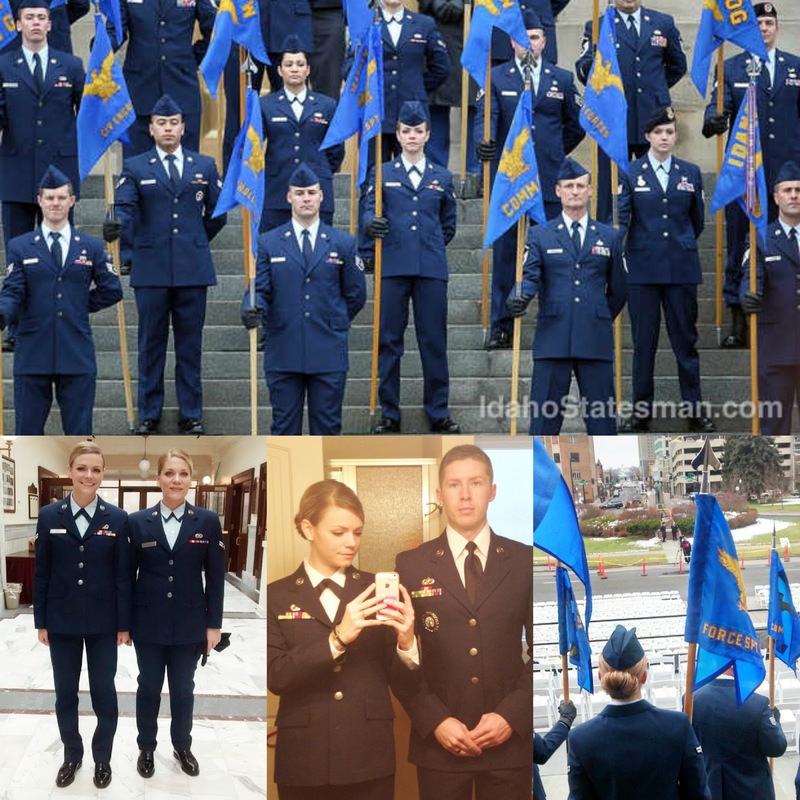 I have never been so proud to be an American, a member of the Idaho Air National Guard, or a citizen who has the opportunity to serve our country. And getting to do it alongside my husband? That's the icing on the cake. I am an American Airman. What an honor. Love this post, Aunie! Other than my husband, my family struggles to understand why I want to join the military at this point in my life. I'm all about personal growth and learning new things by stepping out of one's comfort zone. =) I'm excited! ...and goshdarnit! You look good in that uniform too! We're the ones lucky enough to have service personnel like you looking out for us. I admire you for your service, but also for your pride. I've found that when players take that kind of pride in their team and their play, great things happen too. Two thumbs up to the personal growth you'll experience!! Aah, thank you Eesh! You're always so sweet. I'm incredibly thankful for you!! Thank you, Eli! I'm beginning to see the fruit you speak of. It's such a great thing to be a part of! Thank you again. you're so amazing, they're lucky to have you! This story is very inspiring and I know the anxiety you are going through. No matter our deficiencies (I have many of my own) Christ promises that not only can we do all things through Him that strengthens us but that He will never leave us or forsake us. He spoke to me when I was stressed and having suicidal thoughts one day and whispered to me this verse "My grace is sufficient for you for my strength is made perfect in weakness". Everybody has something that they do or have done that they were or may be ashamed of but if we didn't have that in our lives would we really be challenged to persevere in life? Could we really be the person we are today if we had no issues or problems to face? God allows these "thorns in the flesh" to show us what we can become despite them. I will be joining the Air Force within the next year or two after receiving a nursing degree and at first my only aim was to read about your experiences in BMT but after reading other blogs I know God brought me to this post for a reason and I am thankful that you too are a Christian. Keep up the good work Annelise. God bless you girl. I'll leave you with a link regarding one of my favorite poems that inspires me to press toward the mark for the prize of the high calling of God in Christ Jesus. You're sweet, Laura. Thank you so much! Laura, thank you SO MUCH for this comment! You are wonderful. God is so good with the thorns, like you said, that he puts in our lives. They're placed there to make us stronger! I wish you the best of luck with your journey in the Air Force. It's such a great honor and I know you'll love being a part of it!